In 1995, prolific exploitation director Al Adamson was murdered by his contractor, who buried him under the floor of the new bathroom. An ignominious end to be sure, but Al certainly left behind a ton of highly entertaining low-budget cheese-fests — stuff like Satan’s Sadists, Black Heat, Blazing Stewardesses, and Blood of Ghastly Horror. 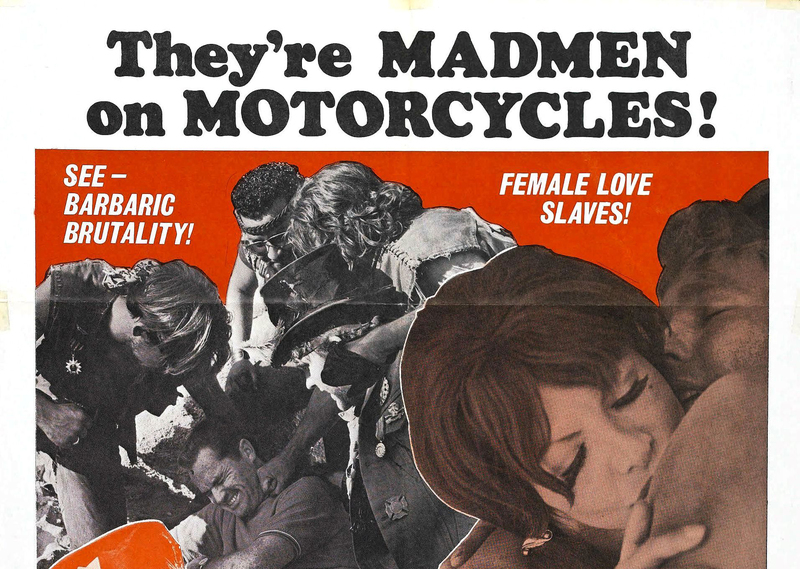 Hell’s Bloody Devils was sold as a biker flick, at least in the trailer I saw, but it’s possible there were multiple ad campaigns targeting different audiences. The bikers (the Bloody Devils, of course) are hardly in the movie, though — instead, it’s a half-assed spy movie, right down to the James Bond-esque title sequence and theme song (“The Fakers,” which is apparently an alternate title for the movie). I’m gonna take a stab at describing the plot, but I could be way off the mark here: As the movie opens, the Bloody Devils fake out a couple guys in a car, then beat ’em to death with chains while calling them “commies.” It seems the bikers have been hired by a saucy young lady who works for Count von Delberg, a counterfeiter who is also trying to revive the Nazi Party. We cut to “Syndicate Man” Mark Adams, who punches out the driver of the car he’s in and jumps out. The car goes over a cliff and explodes, then we go into flashback. Adams is our James Bond, a suave fellow who is actually an FBI agent, working undercover as a thug in the employ of a mobster in Las Vegas. I think. The FBI agents are led by Broderick Crawford, who seems cranky but delivers his usual gruff performance. He’s not happy about having a female agent on the case, but eventually Scott Brady (Lawrence Tierney’s brother) shows up and helps her out. There’s apparently a lot of intrigue and whatnot and occasionally the Bloody Devils show up to make out with some chicks and act tough. Eventually, the movie catches up to the scene where Adams punches out the guy in the car and an exciting climax ensues. Hell’s Bloody Devils is incredibly screwy — I mean, John Carradine shows up as the owner of a pet store who waits on a pair of twins who don’t understand why their lovebirds aren’t getting it on — but of course, that makes it all the more watchable. If you’ve never seen an Al Adamson movie, this ain’t a bad one to start with — make it a double-feature with Satan’s Sadists and you’ve got one heck of an evening ahead of you, as long as the liquor flows freely.